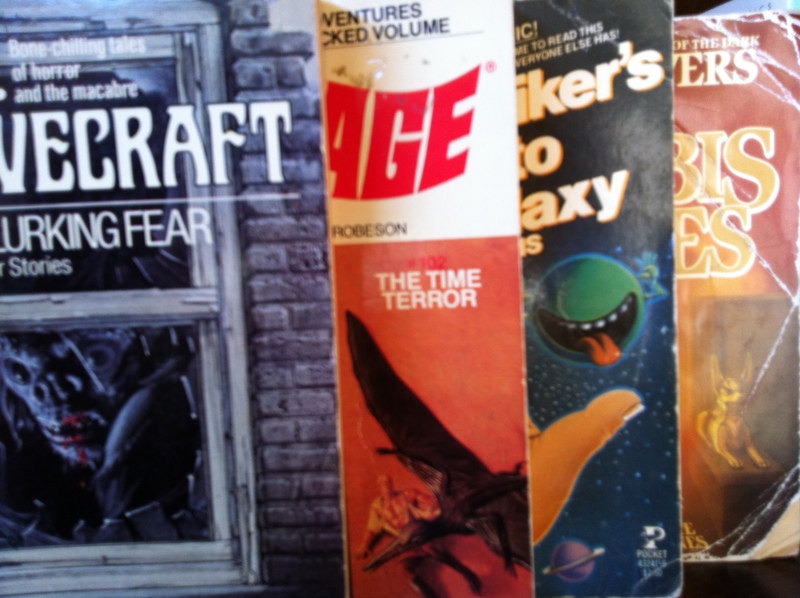 Last post, I showed a picture of some books from my early reading days that I found in my parents’ basement. They’re only a smattering–the ones that never were lost/loaned/stolen like many others. They represent the tip of my sci-fi/fantasy boyhood iceberg. Edgar Rice Burroughs Mars stories. A Princess of Mars through Master Mind of Mars. Massively wonderful adventure yarns with a surprisingly postmodern narrative frame. When I read a late ’90s Gabriel García Márquez interview where he mentioned loving Burroughs, it validated my ongoing love for something that had become a guilty pleasure. Tim Powers’s The Anubis Gates. Hasn’t left my shelf since I bought it from a grocery store book rack. I’ve read it more times than I can count on fingers. Love the way he treats magic. Has my favorite plot reversal and my favorite use of a pop song in a novel. The Hitchhikers’ Guide to the Galaxy trilogy. Loved these, and the radio show, and the TV series. First book I remember laughing out loud while reading. Doc Savage #101/102: The Pharaoh’s Ghost and The Time Terror. They were still publishing these as two-for-one paperbacks when I was a little kid. Glad I had this when I rediscovered Doc as an adult. H. P. Lovecraft. Those 1980s Del Ray paperbacks with the eerie black-and-white covers ruled. Still, there’s something appropriately werid about them–they look very ordinary and very unnerving at the same time. This entry was posted in All Posts and tagged anubis gates, Doc Savage, Douglas Adams, John Carter, Lovecraft, Nebula Awards, nostalgia, Sci Fi, steampunk, tim powers. Bookmark the permalink. Just to clarify, this guy’s not me and I’m not him. And neither of us (unfortunately) are that guy from Wavves who dated Bethany Cosentino from Best Coast.